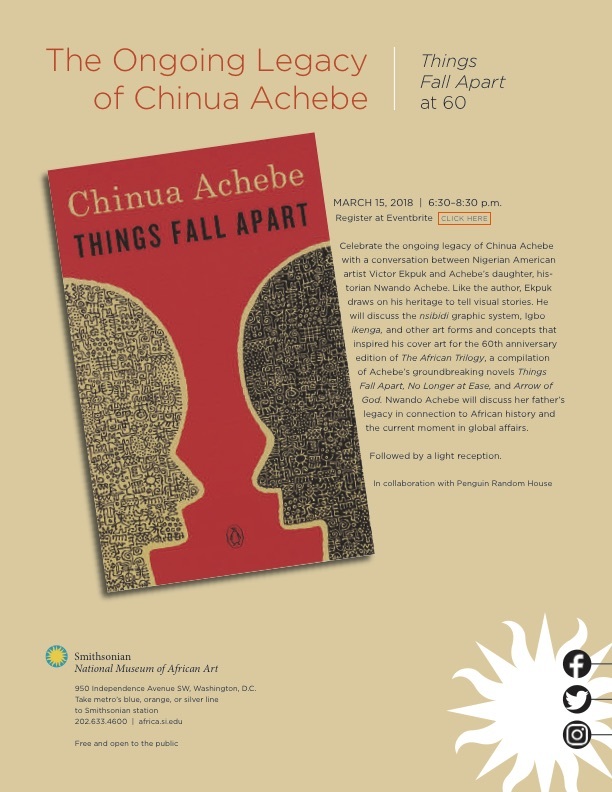 Join the Smithsonian National Museum Of African Art and Penguin Random House to celebrate the life, work, and ongoing legacy of Chinua Achebe with a conversation between renowned Nigerian-American contemporary artist Victor Ekpuk and Chinua Achebe’s daughter, esteemed historian, Nwando Achebe. Ekpuk will discuss how he draws upon and advances Nsibidi philosophy and writing systems in his colorful re-creations of the cover art for the 60th anniversary edition of Achebe’s ground-breaking trilogy, Things Fall Apart, No Longer at Ease, and Arrow of God. Achebe will share discuss her father’s legacy in connection to African history and current moment in global affairs. Where: Smithsonian National Museum of African Art, 950 Independence Avenue Southwest, Washington, DC 20560, United States. This event is free. Register here.